If you snore loudly, or have been diagnosed with Obstructive Sleep Apnea, Dr. Kardaris will offer options for relief. Sleep Apnea is the condition of multiple pauses in breathing for 10 plus seconds at a time during sleep. Symptoms include heavy snoring and tiredness during the day. The most common form of sleep apnea is obstructive sleep apnea, (OSA), it is caused by a blockage of the airway, usually when the soft tissue in the back of the throat collapses during sleep. Take these simple tests to see if you are at risk from sleep apnea. If you think that you are at risk for sleep apnea or have already been diagnosed with sleep apnea then you should make an appointment with Dr. Kardaris for a free consultation. 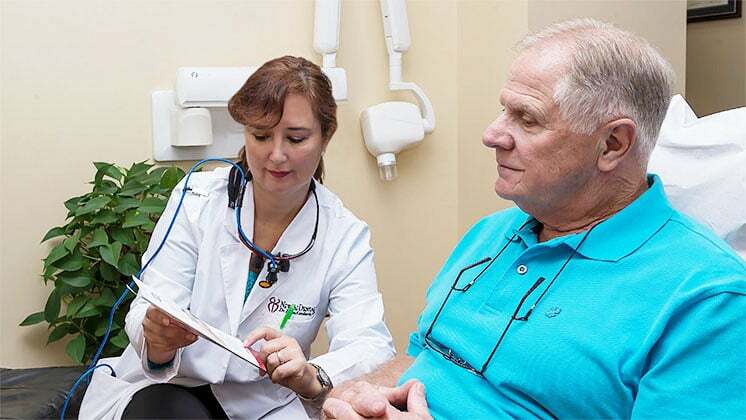 The consultation consists of an exam and getting your questions answered about sleep apnea and the treatment.If needed a treatment plan will be made. A patient diagnosed with sleep apnea can receive Oral Appliance Therapy. Dr. Kardaris will design and customize a TAP® application so that it fits comfortably. It is similar to a night guard. The TAP (Thornton Adjustable Positioner) was designed to keep the airway open to allow for air to pass. The TAP device comfortably holds the lower jaw in a forward position, preventing the soft tissue of the throat from collapsing and obstructing the airway to reduce snoring and improve breathing. Each TAP device hasan adjustment key which enables you to adjust the forward position of the lower jaw until a comfortable and effective position is achieved. Studies show compliance rates for Oral Appliance Therapy of 77% to 95%. Effectiveness is very high in non-severe sufferers of sleep apnea and of moderate effectiveness in severe sufferers of sleep apnea.